The Messages Collection stores all of your saved Email, ONTRAmail and Task messages. It is accessed through the Campaigns > Messages main menu item (in some accounts the Messages Collection will be found in Contacts > Messages instead). Hover just to the left of the column heading, then click and drag the < > symbol to resize the column. Name - The name you give the message. This is not seen by your contacts. Spam Score - A score added by SpamAssassin; scores of 5 and above are not sent. Scores of 3 or below are considered excellent. Type - ONTRAmail, Email, and Task are the basic Types you will see here. 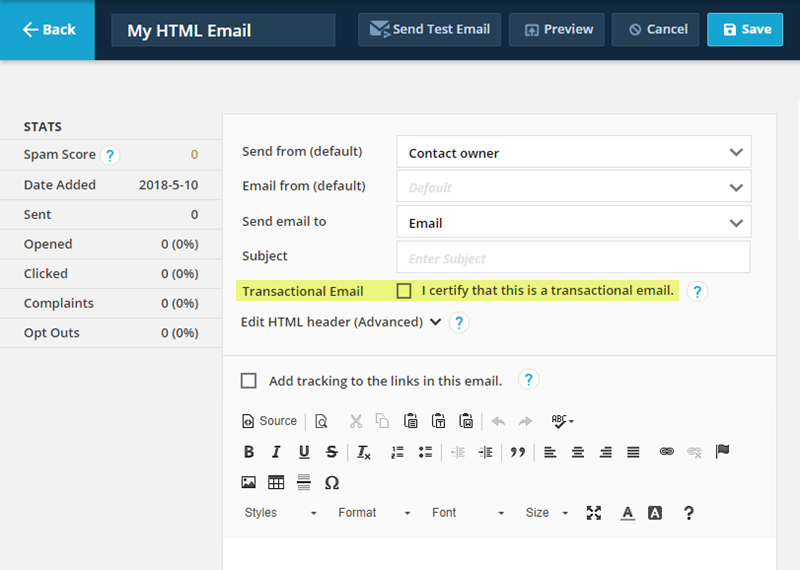 If the Type is "ONTRAmail (Transactional)" or "Email (Transactional)" then the email has been selected as Transactional Only. Sent - The number of messages sent. Opened - The number and percentage of sent messages that we could detect were opened by the recipient. See note. Note: We use a single pixel transparent image that is loaded from our servers to detect if the email is opened. If the recipient has images turned off, or uses a privacy plugin they will not be counted as an "Open". Links are tracked 100%, so a click on a link is always counted. You may see "clicks" outnumber "opens" for some messages. Clicked - How many recipients clicked at least one link in the email. Not Clicked - How many recipients did not click any links in the email. Opt Outs - How many recipients clicked the "Manage Your Subscription" link and opted out. Complaints - How many recipients complained that your message was spam. Sort your Messages by clicking on the column headings. Click the heading again to reverse the sort order. Any of the columns you add can be sorted in this way. Change the number of messages that display on a page at the bottom of the page. This setting will remain in place until changed again. Also note the status bar indicates the page that you are currently viewing. Click the Group drop down list to create a new Group, or load and manage any existing Groups. You can set criteria to filter messages in dozens of ways, and save the Group for viewing later. 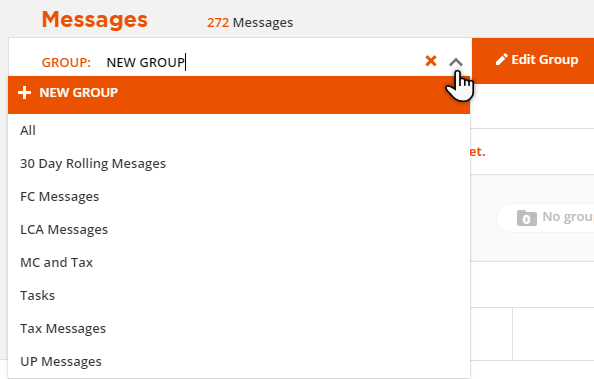 Each time you display the Group the system rechecks and adds all messages that meet the criteria automatically. Examples include messages created within the last 30 days, all messages with names starting with the letters "MRKTG:", or to only show one of more of the message Types. To search for a value in your Messages Collection that is displayed in one of the column headings click in the search bar, enter your query, and press the Enter key. You can also select the HTML Email editor whenever composing a new message, for example in a workflow in a sequence Email Step or the Contacts Actions > Email function. 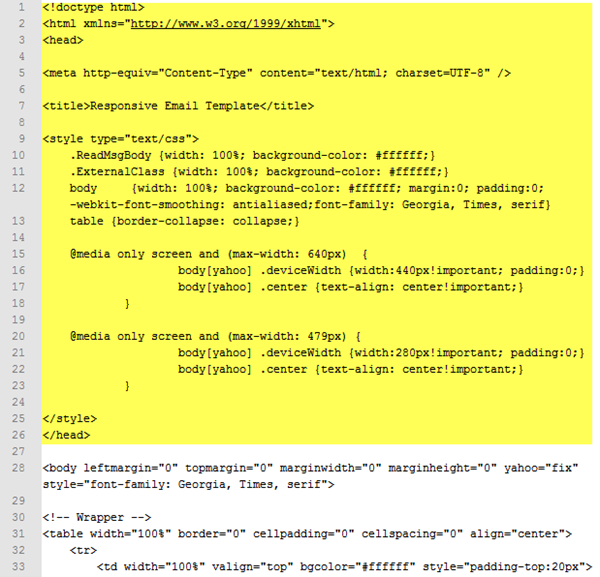 Next is the Edit HTML Header (Advanced) section. 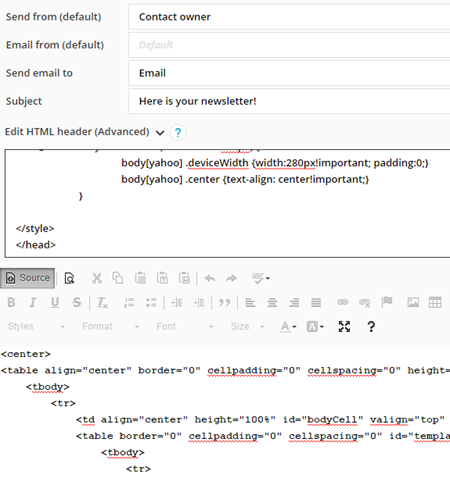 It expands to accommodate information to be added to the "HEAD" of the email (usually found in an HTML email template). utm_campaign - This will be the Campaign, Sequence or Rule name if the email is sent from a Campaign, Sequence or Rule, and the date if the email is sent from the Contacts Collection as a broadcast. Please make sure your Campaigns, Sequences and Rules have names that are suitable to be seen by your customers if you use this feature. utm_source - This will indicate if the email is sent from a Campaign, Sequence, Rule or broadcast with tags such as "ONTRAPORT-email-campaign", "ONTRAPORT-email-rule", etc. utm_medium - The same tag from the utm_source parameter is used for the utm_medium tag. utm_content - The subject line is used for the utm_content parameter. utm_term - This is only used when the email is sent as a broadcast from a Group Action in the Contacts Collection. The name of the Group is included in this parameter. Please make sure the name of your Group is suitable for disclosure to your customers when using this feature. Note: Using the Add tracking to the links in this email is optional. ONTRAPORT already allows you to define Triggers, Goals and Conditions in Campaigns for any link that is clicked in your email. 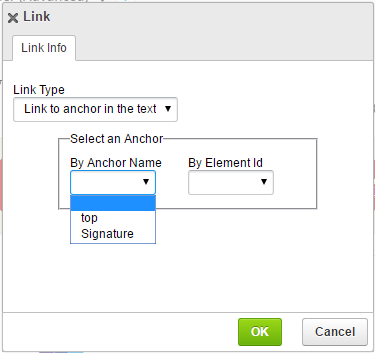 This feature simply adds some additional tracking capabilities to links, primarily for use in Google Analytics. The Source button toggles between raw HTML code and the visual representation your contact will see in their inbox. When pasting in HTML source code remember to click the Source button first. All the other editing buttons will fade to light grey and become inactive. Paste the code and click the button again to toggle to the visual view. The Preview button next to it opens a new browser window with the email rendered in it. Note that this preview mode does not replace merge fields with data. The Clear Formatting button removes selected HTML code from the selected text. For example, it will remove the italics added to header text, but leave the text formatted as header text. Click this button to expand the editor window to fill the browser viewport. Click it again to revert to the normal view. The Maximize button expands the editor window to fill the browser viewport. Merge fields can be inserted into your email messages to personalize them. Nearly every field in the Contact Record is available as a merge field, including the contact's name, address, the last invoice amount, etc. In addition, all of the ONTRApages and legacy Landing Pages are listed to be included as personalized URLS, or PURLS. See our article Formatting Merge Fields for information on formatting options and the default value you can display if the Contact Record field is empty. Type the text you want to use for the link, such as "View this Email on the Web", and highlight it. Click the link icon (1), select the < other > protocol (2), and type the merge field [Hosted_Email_Link] into the URL box (3). Click OK.
HTML email templates are usually provided in one file containing the raw HTML. At the top of the file you may find "header" or <head> information. Copy and paste that information into the Edit HTML Header (Advanced) section. You can now finish editing the email in either HTML Source or, by clicking the Source button again, in Visual mode. Links render as blue underlined links in most cases. This format allows recipients who use older or simpler email clients to view your message. Including a text version is also important for the delivery of your message. If the plain text version is not present or does not match the HTML version of your message, the email will likely be sent to spam or discarded. Because of this, it is a best practice to click the "Copy from HTML" button after you write or edit any email, then clean up the formatting so it looks nice.